Treasury and Finance Minister Berat Albayrak speaks during a meeting with businesspeople in Bursa yesterday. The Turkish economy underwent a two-month period of economic turbulence in August and September, triggered by a tumbling currency and running inflation. In the face of these developments, the economic administration has taken a number of measures to ward off the repercussions of this turbulence. The measures stymied the depreciation of the Turkish lira and controlled pricing behaviors while re-ensuring the trust of foreign investors in the Turkish financial system, as seen in the high demand for Treasury bonds. The economy administration's policies, spearheaded by the Treasury and Finance Ministry, also reduced the current account deficit, leading to expectations for positive data by the end of the year. 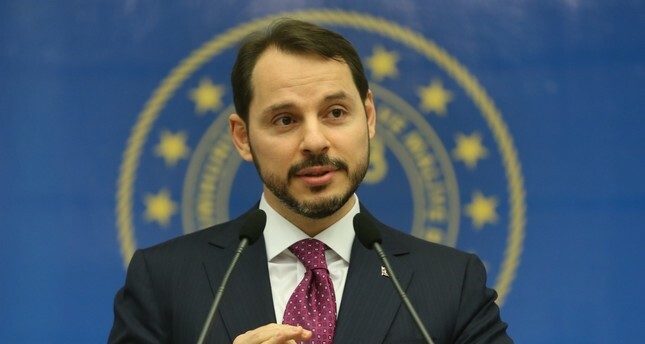 Treasury and Finance Minister Berat Albayrak stressed that the process Turkey witnessed in August aimed to expose Turkey to a vicious circle of exchange rates, inflation and interest rates and it was different from the post-2008 global financial crisis. Despite these developments, a major part of the negative effects of this process has been managed very successfully and the repercussions have been thwarted thanks to quick and effective measures. The minister highlighted that the new presidential governance system, which took effect with the formation of the new government on July 9, enabled the economy administration to take the necessary precautions to mitigate the impacts of the turbulent period. Speaking at a meeting with businesspeople organized by the Bursa Chamber of Commerce and Industry, Albayrak said, "I would like to emphatically state that the Turkish economy is currently performing far better than it did in August and September. We see the improvements in the Turkish lira, the credit default swaps and loan interests." The minister stressed that the economy administration has managed the situation in August and September with very strong coordination. This two-month period, therefore, has equipped Turkey with great experience in managing crises. Since the government started working in July, the number one item on the agenda has been to curb inflation. "The anomaly in the pricing behaviors have disrupted the inflationary developments. Most of the sectors calculated the exchange rates at higher prices, therefore the decline in the exchange rate has eliminated the pricing pressures," the minister said. The Turkish lira hit as low as 7.2 against the U.S. dollar in August due to concerns over the strained ties with the U.S. due to the detention of pastor Andrew Brunson and the imposition of import tariffs on Turkish steel and aluminum in early August. The lira was trading at 5.40 per dollar yesterday. Turkey's Consumer Price Index (CPI) increased by 25.24 percent year-on-year in October according to the data of the Turkish Statistical Institute (TurkStat). The annual inflation increased by 0.72 percentage points from 24.52 percent in September. As noted in Turkey's new economic program announced in September, the country's inflation rate target is 20.8 percent this year, 15.9 percent next year, 9.8 percent in 2020, and 6.0 percent in 2021. The Turkish Central Bank revised Turkey's year-end inflation rate forecast to 23.5 percent. As it did in all other areas, Turkey has also revealed a serious success story in terms of economy in the last 16 years, Albayrak said, adding that while creating this story step-by-step, banking and financial sector, public, private and reel sector altogether registered a serious momentum. He also underscored that following the June 24 presidential and parliamentary elections, Turkey is implementing a structural transformation and will continue to take very important steps on its way to becoming one of the world's most powerful production economies over the next five-year period. Meanwhile, in order to curb inflation and ensure a balance in pricing behaviors, the Treasury and Finance Ministry launched a full-scale campaign in early October with the support of the private sector. Among the measures announced to curb inflation was a campaign of minimum 10 percent nationwide cut on prices. To support businesses and maintain investments, the banks will decrease interest rates by 10 percent on loans issued after Aug. 1. Referring to the campaign, whose impact could be felt as of the end of October, Albayrak said, "Even though this minimum 10 percent campaign started in the second half of October and October is the month that affects inflation pricing the most within the year, it will yield fruits in the remaining months of the year." Albayrak also emphasized that Turkey will face a very clear picture with much stronger and positive results in terms of further decline in the pricing behavior in November and December. The treasury and finance minister stressed that the government announced a number of reductions in excise duty and value-added tax, including real estate properties, furniture, commercial vehicles and home appliances in order to accelerate the efforts to curb inflation and ensure economic rebalancing. International demand for a new Turkish bond offering was more than triple the bonds' actual issue size, the Treasury and Finance Ministry said yesterday. "The offering attracted an order book of more than three times the actual issue size from more than 200 accounts," the ministry said in a statement. On Wednesday the ministry authorized three international lenders – BNP Paribas, HSBC, and ING – to issue a euro-denominated Turkish bond due in 2026, as part of the 2018 external borrowing program. The transaction was finalized with a nominal amount of $1.5 billion ($1.7 billion), according to the statement. The proceeds of the issue will be transferred to the Treasury accounts on Nov. 14. The bond has a coupon rate of 7.25 percent, and its yield rate for investors is 7.50 percent. The largest national share of the bonds was sold to investors from the U.K. – at 35 percent. Britain was followed by the U.S. with 20 percent, Germany and Austria with 14 percent, Nordic countries with 7 percent, France and Switzerland with 5 percent, Benelux with 5 percent, various other European countries with 6 percent, Turkey with 6 percent, and other regions with 2 percent. The new transaction brings the amount of funds raised from international capital markets this year to nearly $7.7 billion. Meanwhile, the Treasury and Finance Ministry on Oct. 16 authorized three international institutions to issue five-year dollar-denominated bonds due 2023. Bonds were worth $2 billion, while the demand totaled $6 billion – three times the initial target. Most of the bonds were sold to investors from the United States, followed by the U.K with 23 percent, other European countries with 11 percent, Turkey with 5 percent and other regions with 1 percent.